2 years experience as Assistant professor in Dept. of Medicine at Meenakshi Medical College, Kanchipuram. 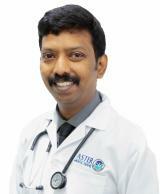 1.5 years experience as consultant gastroenterologist at Bharath Hospital, Kottayam, India. Before joining DM Healthcare he was worked at Madurai Vadamalayan Hospital as Consultant Gastroenterologist, Madurai, India.